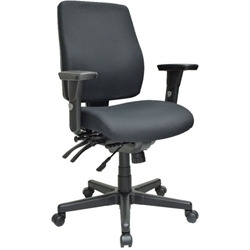 Features: Posture Perfect with the Pump up and release lumbar back insert. Action: Full Ergo 3 lever action with seat slider mechanism. Height adjustable back. Warranty: 10 year factory warranty. Factory Tested to 180 KG. Limited stocks available in Brown only till sold out. Powder coated steel frame in the colour of Chocolate. $55.00 inc gst each while stocks last.